Technology: Upon credit approval, customers can have over $2,000 worth of security and automation equipment (i.e., security cameras, motion and glass-break sensors, door locks, carbon monoxide detectors, energy management tools, and more) installed for free. Mobile App: Customers can download the CPI Security Systems mobile app (available for both iOS and Android devices) to monitor their homes while they’re away. Through the app, customers can view security camera videos, adjust the thermostat, lighting devices, door locks and more. Hidden Fees: Although CPI Security Systems boasts free installation, this promise comes with several conditions. For example, the cost of a CPI security system can be extremely high if you don’t own your home, as CPI Security attaches a hefty $299 installation fee for renters. All customers, whether they rent or own, may also be required to pay additional installation fees for second-story security cameras. And though the website says customers can receive up to $2,200 in free equipment, customers are required to purchase upfront a minimum of $99 in equipment. Transparency: Aside from the technical issues, CPI Security does not clearly state the details of opening an account or service agreement. Actual monthly rates and contract lengths can vary greatly depending on the customer’s credit rating, and the CPI website yields little information for customers to reference. In order to receive an accurate quote, customers must first receive credit approval. Availability: CPI Security Systems is only available in four states (Georgia, South Caroline, North Carolina, and Georgia), whereas top home security companies provide security services to all 50 states. Our Recommendation: Despite the initial offerings CPI promises, it turns out that there are restrictions and limitations. For those looking for a transparent home security provider, Protect America and Frontpoint are reputable options. CPI Security offers 24 hour monitoring and a “Real Time Response System” that quickly notifies security professionals when an alarm is activated. Homeowners can easily check the settings of their alarm system on the digital LCD keypad. An innovative feature available with the inTouch security package is that customers can remotely monitor your home from a smartphone or internet connection. Some of the options available remotely include: activating and deactivating alarms, receiving email and text notifications, and changing security codes. If customers choose to add the video monitoring feature, they can remotely view the activity in their home on any mobile device. More features are included in the home automation package, such as adjusting the temperature and turning on lights remotely. CPI Security Systems allows their customers to customize their security systems. They have two “packages,” but all it really is are two different categories of equipment for customers to choose from. Just because a customer picks to go with a basic option, does not mean there are set sensors or detectors. Customers will get to design the system and receive a quote at the end of the decision making process. Whether a customer chooses to go with the inTouch service or a basic package, there is a monthly monitoring agreement that is required. Contract length will vary based on equipment purchased and monthly servicing. If a customer decides to end the monthly monitoring service early, there will be a cancellation fee that will apply. This means that the customer will need to pay for additional months of services rendered. Since each and every CPI security system is customized to fit the unique vulnerabilities of each home, a CPI certified technician will need to install the system. There is no DIY option with CPI security systems. However, installation is free of charge after the system has been purchased unless the home is being rented.Renters must pay a $299 installation fee. After the customer has come to decide on the exact design and specific equipment, they will need to schedule a time for the technician to come to the home and install the system. CPI guarantees that their technicians will perform the installation without causing damage and will clean up any mess that is made during the process. All installation technicians are CPI employees, no installation is every outsourced to subcontractors. CPI Security Systems provides professional 24/7 monitoring. When an alarm has been triggered, CPI’s UL-listed facility responds quickly by notifying both the homeowner and emergency responders. Homeowners can expect a phone call within seconds of the alarm going off. They will need to identify themselves during that call and responders will be dispatched. To learn more about CPI security systems, visit their website for more information. 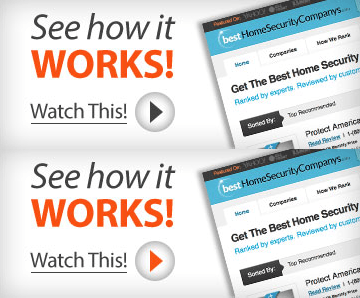 For more information on other home security providers, view other company profiles. The customer service specialist was very friendly and knowledgeable. Very personalable! Person was a knowledgeable and very polite.. Good customer service..
Michelle helped me with the decision switching to CPI as she explained to me about their product thouroughly and the benefits I could get from them. After givig me the plan options and sensors/equipments upgrade she patiently waited and gave me time to decide without forcing me into signing immediately unlike other companies claiming you’ll not get any better deal if you don’t sign up right there and then. After several times that I spoke to her and clarified every plan, equipment & payment options and after about 2weeks of decision making I finally contacted her today. Despite a better rate CPI offers, Michelle even gave me extra equipments at no additional cost and confirmed that there’s no time contract that I will have to stay with them before I signed up. If all the pre-wired sensors installed by previous company determined in good working condition, they can use them and assume warranty for as long as I have their service. Installation date was scheduled as I wanted and will find out soon how CPI compares to the company I’m giving up after 9 years of service. For now, thanks again to Michelle. I spoke with Bre today. I’m changing insurance company and I needed a certificate that I had an alarm system in my house. What a very nice young lady. She sent me an e-mail which I had in minutes to sent to the insurance company. Thanks Bre, great job! Absolutely pleasant. Joe was super helpful, patient in answering my questions and very knowledgeable. I can’t get over easy the process was. This 10b is solely for the representative that assisted me with my call today. She was very helpful and thoughtful about concerns about as my security system. The customer service rep was very helpful and very courteous. I spoke with Natalie and she was wonderful. She explained my options and helped me get the best package for my needs. Very helpful customer service agent. Great service! Chelsea was a great rep and was able to assist our every need. Very pleasant. Candidly, I am truly impressed with all the support and knowledge that is possessed by all members of CPI that I had the distinct pleasure of working with. I had some questions with regard to the equipment immediately after installation. To that issue, all parties, reacted with speed and professionalism to solve the problems. Cudos to Thomas, my sales person; Dave, my installer; Santiiago, in tech services; and Belvia in customer service. Obviously,I highlighted these individuals as a result of the personal contact I was afforded. I am totally sure that this behavior is totally within the staff at CPI. Importantly, one has to realize that a company cannot be judged by the equipment they sell. They must be judged by the individuals that comprise the entity who solve your issues.